During the season, the Lakers had won their division, with Magic Johnson collecting his second MVP award. The team swept the first three playoff series (Pacific Division foes: Portland, Seattle, and Phoenix), resulting in a rematch with the Detroit Pistons in the Finals. However, starting off guard Byron Scott suffered a hamstring injury in practice before Game 1 and was ruled out of the series. Then with the Lakers leading early in game 2, Magic Johnson pulled his hamstring and would also be out of the series. The Lakers had won two straight NBA championships in 1987 and 1988 but without their starting back court, their chances were doomed for a "3-peat." The Pistons won the series in a four-game sweep, marking the first time a team (Lakers) had swept the first three rounds of the playoffs, only to be swept in the finals. As of today, the Pistons are the most recent Eastern Conference team to sweep an NBA finals. 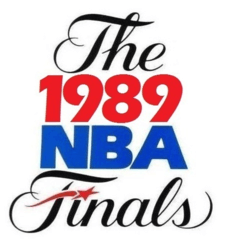 Before the Lakers won in 2009, the Pistons were the last Finals champion to have been the runner-up the previous season as they were in 1988. Before the season began, the Pistons moved from the Silverdome in Pontiac, Michigan to the brand-new The Palace in Auburn Hills, Michigan. The new arena was envisioned by Pistons owner William Davidson. The arena consisted of luxury boxes and club seating, which added profits compared to older arenas. The Pistons sold out all 41 games at The Palace. James Worthy, the lone Laker weapon left, drove to the basket and was fouled, giving him an opportunity to tie the game. The 1988 Finals MVP, however, missed one of two, leaving the Lakers short at 106-105. Isiah Thomas then hit two free throws with a second remaining for the final 108-105 score. The Pistons had a 2-0 series lead, but knew it would be tough going in L.A. Magic Johnson tried to play, but the pain of his hamstring injury was just too great. He left Game 3 after just five minutes of the first quarter with the Lakers leading, 11-8. Dennis Rodman, despite suffering from painful back spasms, pulled down 19 rebounds between trips to the sideline for rubdowns. But, the main effort came from the guards. Joe Dumars scored 31, including a remarkable third quarter in which he scored 17 consecutive points (21 in all for the period). Vinnie Johnson added 17, including 13 points in the fourth. Isiah Thomas pitched in with 26 points and eight assists, including six and three in the final period. The Pistons led 113-108 with 15 seconds left, when Thomas allowed A. C. Green to tie him up and steal the ball. Thomas then fouled Lakers rookie point guard David Rivers, who made both free throws, pulling Los Angeles to within three at 113-110 with 13 seconds left. Dumars then lost the ball out of bounds with nine seconds left, giving the Lakers a shot at the tie. The Lakers then ran a play where Rivers got free for an open three-pointer in the corner. From about eight feet to Rivers' right, Dumars wheeled and lunged at the shot. Not only did he block it, he landed and saved the ball from going out of bounds. The Pistons then ran out the clock after Bill Laimbeer's free throw to close the game with a 114-110 win and got on the verge of an unexpected sweep. With the Lakers' backs to the wall, coach Pat Riley admonished his lone weapon, James Worthy, to step up his game. Worthy responded with a championship effort of 40 points on 17-of-26 field-goal shooting with Rick Mahorn in his face every step of the way. But Worthy couldn't do it alone. The Forum crowd was also anticipating Kareem Abdul-Jabbar's possible curtain call. During the pre-game warmups and introductions, Kareem received several well-deserved ovations. The Pistons started fast in the third quarter, beginning with a three-point basket by Bill Laimbeer. Mahorn then scored four quick points, and the Pistons took a 59–58 lead moments later. Dumars hit a driving bank shot, drew the foul and made the free throw, giving him 19 points on the evening. Mahorn followed that with another bucket and the Lakers called timeout. Worthy heroically led the Lakers back into a 78–76 lead at the end of the third, but they knew the Pistons were coming on. The Pistons took control of the game in the fourth, with James Edwards scoring particularly well. With 3:23 left and the Pistons with a 100-94 lead, the crowd rose to a standing ovation as Kareem Abdul-Jabbar left the game, more a note of thanks than a plea for a miracle. For the next two minutes, it seemed nobody wanted to hit a shot. Abdul-Jabbar re-entered the game and spun and hit a bank shot with 1:37 left, his last two NBA points, cutting the Pistons' margin to 100–96. Kareem went out of the game with 47 seconds remaining amid thunderous applause. Laimbeer hit a jumper at the 28-second mark, and the Pistons began celebrating. Riley sent Abdul-Jabbar back in after the timeout, but Michael Cooper missed a three-pointer and Isiah Thomas was fouled. Riley then sent Orlando Woolridge in for "the Captain", this time for good. The hobbled Magic Johnson came out to meet him amid the crowd's warm applause. The Pistons, in a show of sportsmanship, all came to the floor and faced the Laker bench to join in. Thomas then hit the foul shots, essentially closing out the 105–97 win and the championship. Joe Dumars was named Finals MVP.